These plates are issued to to pickup trucks as well as all types of vehicles used for both business and private purposes with a Gross Vehicle Weight Rating up to 12,500 lbs. Up until October 1, 2005, the weight limit was 10,000 lbs. In 2004, P.A. 04-199 changed the requirements for issuance of combination plates to pickup trucks. 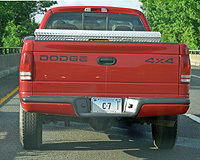 Starting June 3, 2004, non-commercial pickup trucks with a GVWR under 8500 lbs could now display regular passenger plates. Before this, ALL pickup trucks had to be registered with Combination plates. In 1957, standard-size 6×12 plates were introduced for Combination plates. Until 1966, white on blue plates were issued for Combination, and these were distinguished from regular passenger plates by the serial having the first letter as ‘C’. In 1967, the colors were reversed to blue on white. New registrations continued on in the CA-1234 format. Around 1969, the new smaller die set came into use, around the middle of the CB- series. In the mid-1970s, several changes were made. About halfway through the CO- series, the state name became centered between the lower bolt holes (no longer left justified). A smaller die set was used for the state name as well. This didn’t last too long, and with the CP- series, the ‘Combination’ legend was added between the upper bolt holes. This made the slogan-less CO- series tough to find. Around 1980, CZ-9999 was finally reached. For a brief time following this it appears that older, unused numbers from the series were recycled. For example, a CN- series could have been re-issued. Finally, a brand new series was started and the numbering ran from C-10000 to C-99999. This format only lasted about 2 years. Next came all numeric 5-digit plates – 10000 to 99999. This lasted about 3 years until 99999 was reached in 1985. The 100-‘C’AA series came next. In 1987 the map base was introduced. For a brief time just before the map plates were issued, numbers were issued in the old format of CA-1234 and CB-1234. These plates can be identified by the fact that they have reflectorized (glass-beaded) numbers, unlike the previous re-issue of this format around 1980. Numbering continued on with little fanfare until 1996 when 999-CZZ was reached. The 1’C’-0000 format was started. Breaking with tradition, lead zeroes were used after the dot separator, beginning at -0001 instead of -1000. Eventually, 9C-9999 was reached. The ‘C’ was then bumped over one position, and the 10’C’-001 format was begun. These ran until the new reflective base came out in 2000. I’m not sure they actually reached the end of the series at 99C-999. Plates up to 93C- have been verified, but not much higher. In late December of 1999, the reflective light blue base was introduced. The initial numbering format was 12345-C. The ‘Combination’ legend was dropped from the plates, replaced by a stacked ‘COMB’ to the right of the serial. 99999-C was reached before long, and 1CA-123 through 9CZ-999, reached in 2004. The letters were then bumped to the right, and 12’C’-A34 became the new format. In August, 2009 that format was exhausted, and the new series began at 1234-‘C’A. In mid-2014 9999-CZ was reached. It appears the DMV finally gave up on trying to fit the letter “C” in some form in the serial, because a new series was started at 1000-DA. These appear to have been issued until the -DF series. This didn’t last long, however- in August, 2015 the numbering went to 7 digits, and the letter “C” made a return in a C-123456 format; presumably beginning at number C-000000. (no, that’s not a sample plate). These have the stacked “C/O/-/M/B” between the letter and numbers. Various sub-classifications of plates are issued in Combination – Amateur Radio, Handicapped, Preserve the Sound and New York Press to name a few. Carry-over number revalidated to 1966. Carry-over number revalidated to 1973. This number is from the original Combination format. Colors were reversed in 1966 for the 1967 expirations. Carry-over number revalidated to 1976. Notice that there are “Wide” and “Skinny” type Connecticut legends used on these plates. Mid-50’s number carried over to the ’66 base. This number was probably initially issued on the black on aluminum base around 1956. The earliest plates in the CA- series on this base had the letters squashed together with no space, and a dot crammed in the middle like this. I have seen these through at least the CA-5000s. 6-character plates on the blue 1957 base did not have the dot. There is now space for the dot. Later in the CB-series the dies were changed; this took place around 1969 or so. While passenger cars received Polyvend plates for the mid-’70s, combination plates remained like this. About halfway through the CO- series, the layout was changed to this odd-looking style. The “Combination” legend was added with the CP-series. The CN- series was initially issued on the plain, sloganless base in the mid 1970s – see CN-9435 above. This number was reused. Old number re-made in the late 1970s. After CZ-9999 was reached around 1980, they went from C-10000 to C-99999. The numbers on this plate aren’t reflectorized. Another 1981. The numbers on this plate ARE reflectorized. The C-10000 series only lasted about 2 years. Next came 5-digit all-numeric plates. These lasted about 3 years before 99999 was reached around 1985. Next came the 100-‘C’AA series. Sometime just before the map base came out, a whole bunch of old-format plates were issued. Most of these appear to be in the CA- series, but there are a few in the CB- series. These can be distinguished from the early 1980s remakes by the reflectorized glass beading on the numbers. The map base was introduced in 1987, sometime between the -CFE and -CFJ series. I’m not sure why this plate has a December decal. Real nice plate, too bad someone put the decal in the wrong place. This plate would have been issued in late 1997 with this temporary decal. Upon expiration of the temporary decal, the plate would get a normal 2-year July 1999 decal. After reaching 999-CZZ in 1996, the 1’C’-0001 series was introduced. If you’re wondering why this plate has a lower number than the 1997 shown above yet has a later decal, it is because this plate received its 2-year decal upon issuance – so this plate was issued sometime in 1996 with the ’98 decal. The plate to the left was issued in ’97 with a ’97 temp decal. These plates now have the ‘COMB’ legend embossed on the plate, so they use the same blanks as passenger car plates. Two types of decals used for July 2000. The odd-shaped one with no serial number is the less common one. After 9C-9999 was reached, the ‘C’ was bumped over a space, and the 10’C’-001 format started. 4-digit all-numeric Combination plates were issued in the early 1930s. This isn’t a carry-over, but rather a vanity made to match a low-number passenger plate. ca. 1986 plate used until the general reissue in 2000/2001. Like most other types, after renewing registration in 2000 or 2001, the motorist received a white on red ‘Replacement Sticker’ to place on the old plates for use while the new plates were being made with the same number. Combination vanity, again with the replacement sticker. This graphic base was introduced in late December, 1999 with a 12345-‘C’ numbering format. Remake of an early/mid 1980s number. At some point, the COMB legend was embossed in the center, rather than screened to the left. 2008. Last year for stickered plates. In 2004 the numbering became 12’C’-A34. Like most other types, starting in 2006 windshield stickers were used to validate these plates. Also, this particular plate was made after Connecticut stopped using 3M reflective sheeting for the background and started using Avery. 99C-Z99 was reached in mid-2008. Note the sharp cutoff between the blue and white on the late Avery plates. Near the end of the series. After 9999-CZ was reached, they went to the -DA series. The ‘D’ series was only used until around DF-. A 7-digit format was then introduced and the ‘C’ was returned beginning with plate C-000000.